I had the pleasure of catching up with Brian Shively, one of our Quality Enhancement Specialists, last week. He was on the heel of what he describes as a career high. On September 13, 2017, Brian was one of five recipients of the DSPIN Outstanding Direct Support Professional Award. 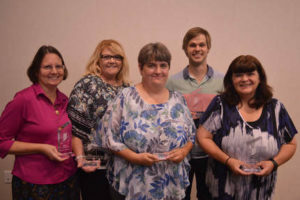 He, with the other 4 winners, was recognized in front of over 220 attendees at the DSPIN Annual Conference. I asked him a few questions about the award and his time at OPG. Here’s what he had to say. So tell me, how does it feel to win the DSPIN Award? Were you shocked? Brian: It was a surprise. I didn’t expect to hear my name at all. When Gail (CEO) told us in a meeting, I had to hold back from crying. I felt excited to receive it, but thought there were others even more deserving. It’s not just me, it’s a whole team of people. I have learned from other DSPs. With this question alone, I can already see why Brian has been chosen as a recipient of this award. He is selfless and a team player. What’s your favorite part about the job? Does it even feel like a job to you? I realize somehow, my presence has helped others create true friendships and reciprocal relationships, and I am honored to witness it. You said there have been ups and downs during your 5 years at OPG. What’s brought you to your breaking point as a DSP? How did you overcome that? Brian: There have been plenty of times when pods were chaotic, causing anxiety for all. The staffing shortage is hard because there are people who need so much more support than we can give them. Whenever pod causes more anxiety, on and off, it s been hard…but it’s worth it when people are happy to be there. Listening to Brian talk, I can hear the passion in his voice. He has gotten to know his pods so well. It’s clear he is dedicated to them. In your opinion, what legacy are you creating at OPG? Brian: I feel like I’m just a part of the team. I’m just doing what we all do. I think I do a good job of making the people I support feel heard. They matter and are important to me. Becoming a QES and getting the DSPIN is the highlight of my work life thus far. Someday, I want to be a marriage and family counselor. My entire life, I’ve been really good at listening and making sure people feel heard. I focus all my attention on the person talking, so I think that would work well in counseling. Brian studied Counseling for his Undergraduate degree. He is interested in pursuing his Graduate degree. As we concluded our interview, Brian wanted to make it clear that he accomplishes nothing alone. In his opinion, he plays a part of a team. We couldn’t be prouder of Brian. Congratulations on your award! Explore the company by reading our original blog content, and keep up-to-date with the important happenings affecting our OPG family today. From the latest updates in culture and events, to all the stories you need to see, OPG is here to keep you in the know.